"The Norwegian Grey Troender (Norwegian: Grå trøndersau) is a very rare breed of domesticated sheep that originated from crossbreeding native landrace sheep with the now extinct Tautra sheep in the late 19th century. There are currently approximately 50 individual animals, nearly all residing within Norway." The Tautra breed may have had Merino blood which could explain the softness and crimp. (I think they look like Merinos from the old photos). The description of this fleece was: "A rare Norwegian breed from Trondheim, Gra Trondersau is soft, silky, crimpy and lofty. 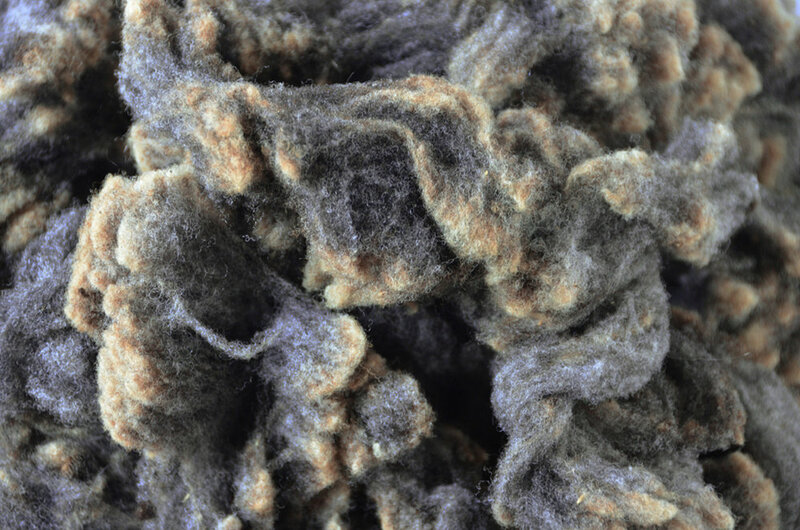 A dense fleece with great locks. Some weathered tips, and some minor VM with evidence of the rise typical of more primitive breeds. Very nice crimp. A very pretty fleece." It really is lovely. It's softer than I expected and reminds me of a Shetland. This is the second Gra Trondersau fleece. It feels a bit more primitive - not quite as soft, but the color is very nice. (Norwegian Pelt Sheep) A Norwegian landrace breed originated from Gotland (Sweden) and Old Norwegian breeds (a "grey-bluevariation of short-tailed Spelsau sheep in the early 1960s"). This is the description for this fleece: "Typical blue color with very lovely locks. Soft, silky & shiny. Clean and VM free. Crazy wavy crimp, but a bit shorter than the other Norsk Pelssau. This is a fine fiber! Average staple length 4.5″. So I think this fleece description is understated. The color is an absolutley stunning silver. 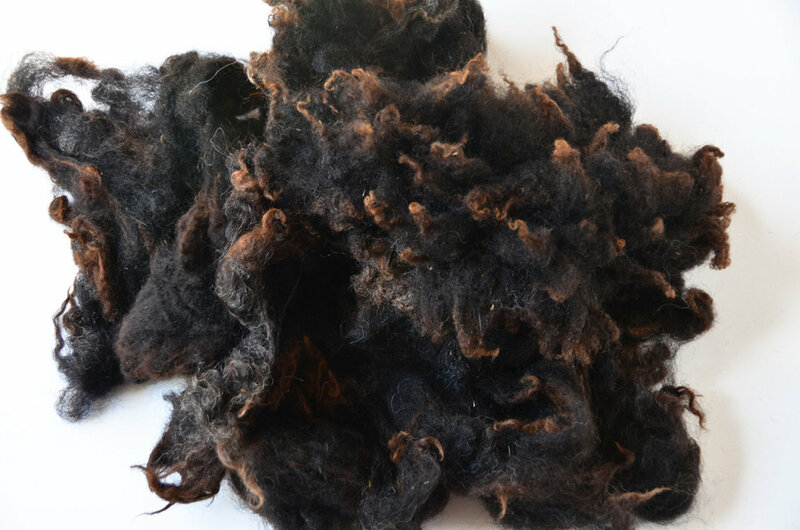 It has a beautiful curly lock structure and the lustre of a Cotswold when washed. I am in love with this one. From Wikipedia: "The Ryeland is one of the oldest English sheep breeds going back seven centuries when the monks of Leominster in Herefordshire bred sheep and grazed them on the rye pastures, giving them their name. It was introduced into Australia in 1919 and are classified as an endangered breed by the Rare Breeds Trust of Australia and also are one of the nine heritage breeds that were the foundation of the sheep and wool industry in Australia. The Ryeland was one of the breeds used to introduce the poll gene (no horns) to the Dorset breed in the development of the Poll Dorset. " Here is the fleece description: “Blackie” Very pretty charcoal with nice staples and low VM. Some weathering. Scours true to color. Average staple 3″. This is a very interesting fleece. It is very dense with a fine crimp that reminds me of a sponge. The tips are cotted a bit but I love the blunt shape of the locks. They are almost perfect rectangles. A very cool fleece. Most of the Shetland fleeces I have spun are not double coated so I chose this for that reason and also the very beautiful black color. It has long typical primitive staples that I think would make a cool rug. Here is the description: "Low VM, nearest to true black on a Shetland I’ve seen. really nice dual coat with very pretty locks. I love this fleece. Average staple 6″"
You can read more of my sheep breed studies closeups here.